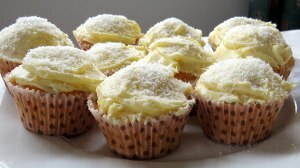 This is another of Jodi’s cupcake recipes, from my novel Scrappy Cupcake Angels. Preheat the oven to 180ºC. Line patty pans or muffin trays with paper cupcake cases. Cream the butter and sugar. Mix in the eggs one at a time, then the milk. Add the sifted flour, baking powder, and salt. Mix to combine, then stir in the coconut and lemon zest. Divide the mixture between the paper cases. Bake for 20 minutes. Cool, then ice with the lemon frosting and sprinkle with coconut. Makes 12 large or 18 small cupcakes.